The percentage of younger workers in the workforce is declining in NH, as it is across the country, but the trends are different for specific industries and occupations (more about that in a later post). Simply put, some industries are capturing a larger share of a smaller cohort of younger workers and the key for any industry or occupation is to have appeal for younger workers and students. How does an industry capture more younger workers? Is it because the industry is perceived as being desirable or “cool,” or do younger workers respond to signals about the opportunities in an industry or an occupation? Manufacturing is one industry that has been capturing a smaller share of younger workers (government and utilities are others). The chart below shows that over the past 15 years the share of younger workers (age 25-34) declined in NH’s workforce (age 25-64). 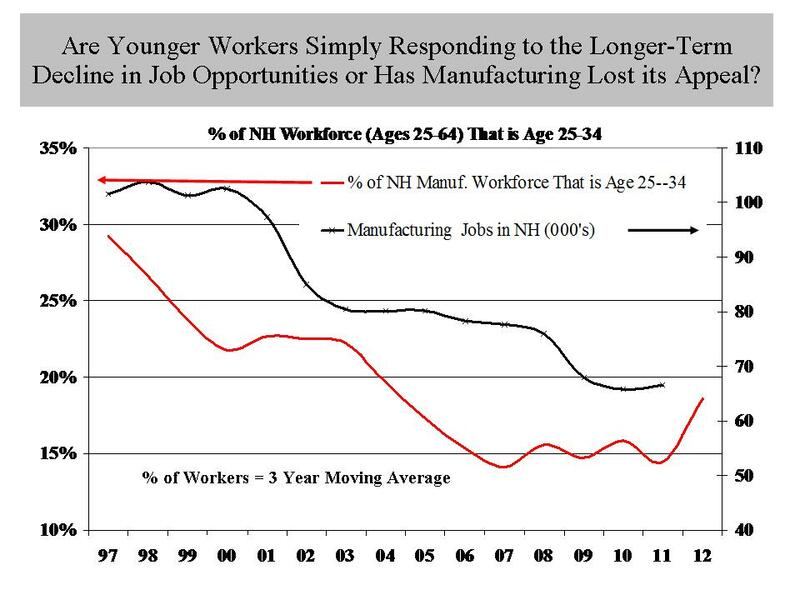 But the chart also shows that the drop was more pronounced in manufacturing than in the workforce overall. Government employment hasn’t been perceived as cool for some time but job opportunities have grown or remained steady (except in very recent years) over the years suggesting that “coolness” is a factor in the career choices of younger workers. For manufacturing it is likely to be a combination o cool and opportunities. While manufacturers now have good opportunities for young workers, that perception must overcome decade s of labor market signals showing large declines in manufacturing employment. 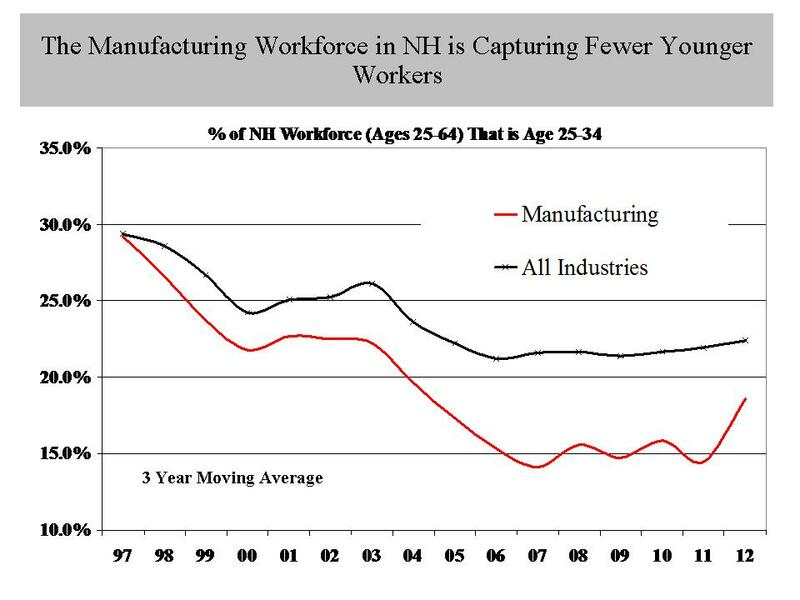 The decline in younger workers in manufacturing roughly corresponds to the change in manufacturing employment in the state (chart below). Manufacturing employers are in a difficult position. Fewer households have workers with a history of manufacturing employment, limiting the legacy effects that can contribute to career choices. A “twist” (changing occupational makeup) in the manufacturing labor market mean that much of the public and almost no high school guidance personnel have an understanding of the types of jobs in manufacturing. A general lack of “coolness,” perceived lack of opportunities, and limited understanding of the opportunities that exist in the industry all mean that manufacturing will have a tough time capturing a larger share of the younger workforce, but it is important to do so for a number of reasons. I just don’t know if manufacturers can do it alone. This entry was posted on October 12, 2012 at 12:13 pm and is filed under Demographics, Educational Attainment, employment, job growth, Labor, manufacturing, NH Economy, Skills Gap. You can subscribe via RSS 2.0 feed to this post's comments.